Important note: This blog post is one of the top hits on Google for “googletest visual studio”. 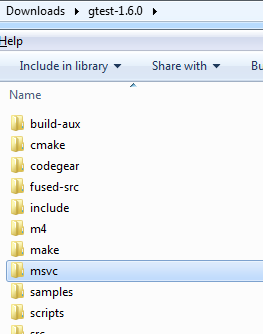 It is however quite old, and might no longer reflect the best way to use GoogleTest with Visual Studio. Google C++ Testing Framework (aka. GoogleTest) is a unittesting framework for C++. This post describes how to install it, and set it up in your project. I am using GoogleTest 1.6.0 here, but other versions should be similar. 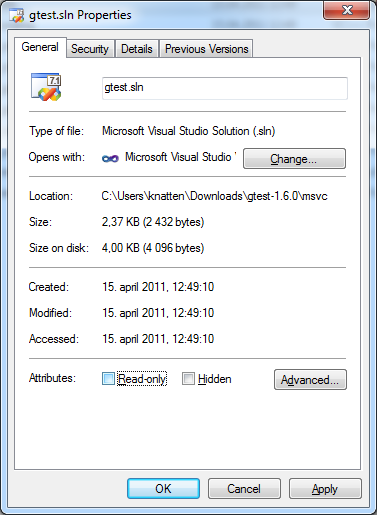 The instructions provided are for Visual Studio 2010, but 2012 should be exactly the same. Make sure to set up the test project to use the same runtime library as your production project (MT / MTd / MD / MDd). Under Linker -> Input , add a dependency on gtest.lib for your Release configuration, and gtestd.lib for your Debug configuration. Unless you want to write your own main function that runs all the tests, also add a dependency on gtest_main.lib / gtest_maind.lib, respectively. This will add a main() method to your project which discovers and runs all the tests. Under Properties -> Linker -> System, set SubSystem to Console, to keep the test-window open after the tests have run. And that’s it! Now you can start writing and running tests, but since the documentation already describes that pretty well, I will not go into that here. If you want to have a look at the code from my Kjeller Software Community demo, it is available on GitHub. Note: To use GoogleTest in Visual Studio 2012, you might need to set _VARIADIC_MAX=10 under Properties->C/C++->Preprocessor->PreprocessorDefinitions on the projects that use it. Even after getting the _VARIADIC_MAX=10 trick, it still took some work to build gtest-md in VS 2012. First there are build warnings because the project’s final outputs don’t match the expected $(TargetPath). I think you can ignore these, but I actually changed the projects to make the outputs match. Then there are problems if you choose Rebuild Solution, because some of the cleanup happens at the beginning of each project. First, gtest-md builds fine, and then gtest_main-md builds fine. At that point it attempts to build gtest_prod_test-md and gtest_unittest-md. But since it’s a _rebuild_ command, additional cleanup first happens in the output directory. This has the side effect of deleting gtest.lib (the main output from the first project). And thus the last two projects fail to link. Building (not rebuilding) the projects one at a time (in the proper order) solves the problem. Great entrance into gtest with vs. Thank you so much for putting this up! Most excellent! Thank you. This should be part of the Google Test documentation as how to get up and running quickly with Visual Studio. In the “Setup for Your Project” you do not say what type of project (EXE, DLL, LIB?) is the test project. Thanks for the notice! I’ll have a look the next time I’m on a project that uses GoogleTest and Visual Studio. Another great solution from the Internet that doesnt work and never could have possibly worked. Great job. I’m sorry you didn’t find anything to help you in this post. As mentioned in the first paragraph, the article is old and not up to date. I hope you were able to find more up-to-date information elsewhere. There’s more to do if you want 32 bit and 64 bit build modes to be possible. It seems to be 32 bit only.